The Tony Award-winning Best Musical of 2005, "Monty Python's Spamalot," will visit Springfield for one performance only on November 4 at Symphony Hall. Lovingly "ripped-off" from the internationally famous comedy team's most popular motion picture, "Monty Python and the Holy Grail," this musical is the winner of three Tony Awards including Best Musical and Best Director (Mike Nichols), as well as the Drama Desk and Outer Critics Circle awards for Best Musical. 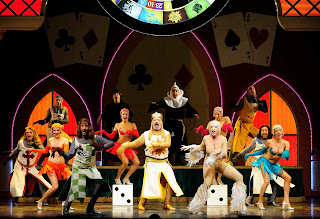 Telling the legendary tale of King Arthur and the Knights of the Round Table, and their quest for the Holy Grail, "Spamalot" features a chorus line of dancing divas and knights, flatulent Frenchmen, killer rabbits, and one legless knight. Monty Python isn't a person, but a group of British actors and writers (and one American) that performed their famous comedy show "Monty Python's Flying Circus" on the BBC from in the 70's, with subsequent international fame and success. For ticket information on this and the rest of the Symphony Hall Broadway Series (which includes "Fiddler on the Roof," "Grease," and "Legally Blonde") call the box office 413-788-7033.